KOKOMO, Ind. 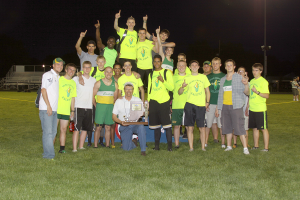 – For the first time in school history, the Eastern Comets completed a clean sweep of the annual IHSAA track and field sectionals. The girls squad defended its title at Madison-Grant, beating Kokomo by 40 points (125-85). For the boys, every point counted – and when they were added together the Comets edged the three-time defending sectional champion Kokomo Wildkats 124.5-121. It was the second title for each program, with the boys coming in 1998. On the girls side, new meet records were the order of the day as seven record-breaking performances thrilled the teams and spectators. As usual, the Neeley twins from Eastern were in the thick of the wins and records. Both Brittany and Bethany entered four events – and they won four events while also breaking four records between them. Bethany broke the 300 meter hurdles record and Brittany now owns the 800 record. They teamed with Jessica Sprinkles and Sarah Wagner to set a 3,200 meter relay mark and ran with Avery Ewing and Sprinkles to win the 1,600 meter relay in record pace. Wagner was a triple winner as she also won the high jump. Bethany earned her fourth victory in the 1,600 meter run and Brittany won the 400 meter dash. Kaitlyn Daanen was a double winner for Northwestern, winning the 100 meter dash and setting a new record in the 200 meter dash. Kokomo’s Anh Phan defended her title while setting a new mark in the pole vault. And Summer Blackamore continued to show her dominance as she set a new record in the discus and also won the shot put. Blackamore was named the meet’s Most Outstanding Performer by the Sports Journal staff. Grant Cole led the Eastern Comets to victory as he won the long hump, 110 meter hurdles and the 300 meter hurdles. Cole overcame an injury that forced him to sit out of the Howard County track meet two weeks ago. Cole’s performance earned him Sports Journal Most Outstanding Performer honors. Cameron Oden was double winner for Northwestern as he claimed the 100 and 200 meter dashes. Long distance specialist Matt Grider won the 1,600 and 3,200 meter runs for the Western Panthers. And Kokomo dominated the field activities, winning four of the five events. Waylon Coulter won the pole vault and high jump while Darrion McAllister took top honors in the shot put and discus. Dozens of Howard County student-athletes qualified for this week’s regional’s as the top four finishers in each of the 16 events automatically advance. For complete results, visit the IHSAA website at www.ihsaa.org.